Affiliated charters: A successful model on its way out? LA Unified has so many different kinds of schools it’s hard to keep them all straight. With such varied terms as affiliated charter, independent charter, magnet school, pilot school, continuation school, option school and others, it can be a challenge to understand what they are, what they offer and how they differ. This is the next part of an LA School Report series taking an in-depth look at the different categories of schools that exist within the massive LA Unified school district. Today we examine affiliated charter schools. One of the most successful school models in LA Unified is also one of the most under-used, and it’s becoming even more scarce. Only one school in the last two years has even applied to become one. The unique “affiliated charter” schools — coined and developed locally at the nation’s second-largest school district — achieve higher test scores than either the district’s prized magnets or independent charter schools. They also have lower absentee rates than the district average. But only 53, or 4 percent, of LA Unified’s 1,274 schools use the affiliated charter model. The schools are located in whiter, wealthier neighborhoods — nearly half of the student population is white in affiliates—and exist in communities where parent involvement has pushed the school administrators into more creative and innovative methods of teaching. Affiliated charters can choose their own curriculum, opt to reduce class sizes or adjust classroom scheduling, offer more professional development and exercise more control over budgeting, hiring and school site decisions. But they adhere to all district collective bargaining agreements. And the district receives most of the state money that goes to an affiliated charter and funnels it to pay for teacher and administrator salaries, although there’s some spending freedom with the rest of the money. A school, for example, must teach basic standards and can buy its own textbooks that are different from what the district uses, but must figure out how to pay for them. In the past year, affiliated charters have ranked significantly higher in the English and math scores than either magnet or independent charter schools. And their California Office to Reform Education’s (CORE) scores from the past year have averaged 79.8 while the district average is 60. Yet this successful school model is on the decline in LA Unified because fewer school principals are choosing the model. One reason is that a majority of the full-time teachers at a school must support the move, and the principal has to initiate the process. Also, the block grant funding that used to flow to affiliated charters was dropped two years ago after the state switched to the Local Control Funding Formula. Finally, the affiliated model depends on a highly committed teacher population as well as an active parent community because the school’s governance board must be made up of equal numbers of both. The idea for affiliated charter schools caught on when it was first introduced in 1993, especially in smaller schools that couldn’t depend on big chunks of money coming to the school because of a larger population. Schools that have become affiliated charters are almost all located in the San Fernando Valley and on the Westside and in predominantly whiter and wealthier neighborhoods. That’s partly because those schools lost their Title 1 money when the district raised the percentage of low-income students needed to qualify. This unique school configuration, which is not even outlined in the California Education Code, now seems to be on its way out. Statewide, 26 percent of schools use the affiliated model, according to the California Charter School Association. Most of the affiliated charters are concentrated in the Northeast and Central Valley region of the state (44 percent) with a small portion in Southern California (12 percent). CCSA considers affiliated charters as “charter schools in name only” compared to independent, autonomous charter schools. Of the 53 affiliated charter schools in LA Unified there are three high schools, five middle schools and the rest are elementary schools. Of the nearly 650,000 LA Unified students, 41,555, or about 6 percent, attend affiliated charters. That’s compared to 107,000 enrolled at 221 independent charters, which are publicly funded and independently operated public schools. Affiliated charter students are not included in the district totals as charter school students, even though the school may have “charter” in its name. They are included among the “regular school” totals because the funding still comes through the district. A total average of 58 percent of LA Unified’s affiliated charter students met or exceeded the standards in the 2015 Smarter Balanced English Language Arts test, compared to 55 percent of the magnet students, 44 percent for the state, 39 percent for independent charters and 33 percent for the district. In the math standards, 51 percent of the affiliated charter students met or exceeded standards compared to 44 percent of magnet students, 33 percent for the state, 28 percent for independent charters and 25 percent for the district. Only 32 percent of the students at affiliated schools qualify for free or reduced-priced meals, compared with 83 percent at independent charters and 77 percent for the district overall. Some of the schools, like Canyon Charter in Santa Monica and Marquez Elementary Charter School in Pacific Palisades, have 3 and 6 percent socio-economically disadvantaged students, respectively. The overall district’s demographics are 74 percent Latino, 8.4 percent African-American, 6 percent Asian and 9.8 percent white. In the affiliated charter schools, 28 percent of students are Latino, 6.8 percent African-American, 9.5 percent Asian and 47.6 percent white. Statewide, as well as within the district, Asian and white students and those who are not from economically disadvantaged households scored significantly higher on the tests. Pick the wealthiest neighborhoods in the LA Unified borders, and you’ll likely find an affiliated charter school there. When broken up by neighborhoods, eight are in Woodland Hills, seven are in Northridge and five are in Sherman Oaks. A total of 43 are in the San Fernando Valley and nine are on the Westside, with one located near downtown. That one affiliated charter school, in the Central district, is Dr. Theodore T. Alexander Science Center School, which ironically is named after the man credited with creating LA Unified’s magnet schools. Not a magnet, the Alexander Science Center does have the highest amount of socio-economically disadvantaged students of any affiliated charter (at 81 percent), and it has the lowest scores at 25 percent for English language arts and 13 percent for math. It has a CORE score of 45. Most affiliated charter schools are in wealthier neighborhoods in part because the principals and teachers want to expand their curriculum to something more than what the district teaches, and their students are much different than those in the rest of the district. 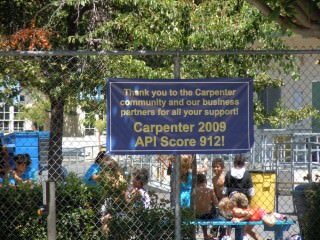 At more than 950 students, Carpenter is the largest affiliated charter elementary school and one of the oldest in the Valley. Parents and the principal applied for its charter in 2010. It was approved for renewal last year for another five years. The parents and teachers on their Governance Council explored other options before re-applying but chose to stick with the affiliated model. Tamar Galatzan, the former school board member for District 3, helped Carpenter with its application at that time. She actively promoted the idea with dozens of other high-performing schools with Academic Performance Index scores exceeding the state’s target score of 800. (Carpenter had 943 at its peak; the tests were discontinued in 2013.) Most of the affiliated charters, 32 of them, are in District 3 and the next highest is 19 in Steve Zimmer’s District 4. Galatzan, who lost last year to Scott Schmerelson, encouraged small elementary schools to go the affiliated charter route and take advantage of block grant funding that was available at the time. WHY ISN’T EVERY SCHOOL AN AFFILIATED CHARTER? Former LA Unified school board member David Tokofsky said he coined the phrase “affiliated” charter. Most other school districts call such a hybrid a “dependent” charter. Schools have to commit to the affiliated charter model, more than half of the teachers have to approve the idea, and the application process can take months if not years. Often, parents who are lawyers and grant writers volunteer their time to fill out the necessary paperwork to become an affiliated charter, which is another reason why fewer school communities in underprivileged neighborhoods with parents working multiple jobs seek to convert to the affiliated charter model. Four years ago, the school board changed the Title 1 qualifications for schools to get extra funding for underprivileged children. It created a big dent in many school budgets, and schools in wealthier neighborhoods had to seek other ways to replace the steep loss of funding. Millikan Middle Affiliated Charter School in Sherman Oaks recorded a loss of $600,000 in one year. Affiliated charter schools also received about $400 to $500 per student as a block grant when they were approved. But that state funding source changed and the block grants stopped two years ago. Many principals no longer saw the advantage of becoming an affiliated charter. Sylmar’s application was approved by the school board on May 10, and it will become an official affiliated charter school in July. Lee sees it making a big difference in the community’s perception of the school, especially in light of this month’s widely publicized schoolyard brawl. Lee doesn’t understand why more principals don’t look at the affiliated charter model. 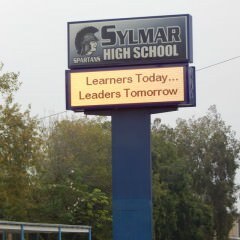 For Sylmar, it has been a laborious four-year journey. It’s a far cry from when the principal came to the school in 2012 when it was considered an under-performing school. Already twice, the district had turned down the application for the school to restructure itself, and at one point before he came to the school, its affiliated charter request was denied. “We had to be ready for the change, and this is the right time,” said Lee, who is following a Small Community Learning model that the teachers have adopted. Affiliated charter schools must renew their application every five years, just like charter schools. Cole-Gutierrez cannot recall an affiliated charter ever failing to be renewed. The schools also have the option to convert back to a traditional school, but that only happened once. Only two schools, El Camino Real Charter High School and Pacific Palisades Charter High School, ever converted to an independent charter from affiliated. When Sylmar High first discussed becoming an affiliated charter with the teachers, many were afraid it would affect their retirement or status with the district, but that’s not the case, as all UTLA agreements remain in place. At Sylmar, the initial vote was close, about 60 percent, but then the teachers did some investigating on their own. In fact, the schools could use their discretionary money to pay the teachers more for extra work, some of the principals said. But the common thought is that families also have to raise more money per student at affiliated charters to help the school, and that is another reason why they are in wealthier neighborhoods. At Carpenter, according to their Governance minutes, the school has raised $350,000 so far with an average gift of $948 per family. More than 20 families gave more than $3,000. A big fundraiser at the CBS Studios lot nearby every year, where they auction items from many of the celebrity families, and an annual golf tournament also raise money. Cole-Gutierrez said that all schools raise money to support their school programs, whether it’s for a full-time PE coach, more books for the library or supplemental art classes. “You cannot depend on family donations to be an affiliated charter, but the schools that are affiliated tend to have more engaged communities from the outset,” Cole-Gutierrez said. Although it’s rarely chosen as a model, the schools that have gone affiliated don’t seem to want to change. “When we first voted, 100 percent of the staff wanted to go affiliated charter,” said Martinez about his Carpenter teachers. In fact, two of them left to form their own independent charter schools after seeing the success. Now the faculty is learning to teach the students Singapore math and are trying innovative writing programs and even a daily relaxation exercise created by Goldie Hawn. Coming next: profiles of Carpenter Community Charter School and the new Sylmar Charter High School.